The school year 1914-1915 was Cummings’ senior year at Harvard, the year he moved the few blocks from 104 Irving Street to Thayer Hall in Harvard Yard. (In the fall of 1915, Cummings continued his education at Harvard, studying for his M.A.) Other residents of Thayer Hall included S. Foster Damon, John Dos Passos, and Robert Hillyer. According to Charles Norman, Cummings “adorned his mantelpiece with four or five elephants and his walls with ‘Krazy Kat’ comic strips” (34). In his junior and senior years, Cummings’ studies shifted from a concentration on Latin and Greek to courses in English and Comparative Literature. Christopher Sawyer-Lauçanno reports that though Cummings started out as a Classics major, he eventually graduated with an “AB in Literature with concentrations in Greek and English” (59). Among the courses Cummings took was the year-long Literary History of England and Its Relations to that of the Continent, which covered European literature up to the Renaissance. He also continued his Greek studies with Greek VI, which studied Greek drama, and he studied Chaucer with William A. Neilson. In addition, Cummings took George Lyman Kittredge’s course that studied intensively six Shakespeare plays. Kennedy writes: “most student recollections depict [Kittredge] in the classroom as playing a well-rehearsed role of omniscient scholar: an imperious eagle-eyed old man hurling penetrating questions or answering queries with authoritative scorn as he lifted his well-trimmed white beard in the air” (Dreams 63). In his senior year, Cummings took a couple of year-long courses that deserve special mention. The first, Kennedy asserts, was “a major educational experience” for Cummings, the “year of Dante under Charles H. Grandgent . . . the foremost Dante specialist in the English-speaking world.” Not only did Cummings read The Divine Comedy in Italian, but also studied “the culture of the Middle Ages, the history and politics of Florence, the nature of allegory, and . . . [read] Il Convivio, De Monarchia, [and] La Vita Nuova” (Dreams 60). Kennedy reports that Cummings was “intensely interested in the material of the course and sat, an alert figure, in the front row. He took extensive lecture notes [and] drew elaborate diagrams of Dante’s Hell, Purgatory, and Paradise with allegorical details minutely placed in the scheme” (60). The second year-long course Cummings took was Dean Briggs’ Advanced Composition. Kennedy writes that “Briggs was no doubt the best-loved professor in the Harvard yard. He was a very kind, gentle, gracious human being,” who, like Cummings, was “slight of build, very boyish in appearance,” and who, also like Cummings, “had attended Cambridge Latin School and went on to study Greek at Harvard” (69). Students in the course wrote poetry, prose, and essays; probably one of Cummings’ first compositions was a sentimental war poem about a grieving mother, “From a Newspaper August 1914.” Kennedy informs us that “his father later had copies of it typed with a new title, ‘The Casualty List,’ and inserted into the pages of Eight Harvard Poets” (134). Sentimentalism did not preclude aestheticism: one of Cummings’ essays from October 1914, “The Young Fawn,” is characterized by Kennedy as “an overwritten scenario inspired by the ballet ‘The Afternoon of a Faun,’ which drew Briggs’s polite rebuke ‘Now and then I suspect you . . . of putting in some details for sound’s sake—of indulging yourself in that for which English 5 is one of the best remedies’ ” (70). Later in the year, Cummings would write an essay on Chinese and Japanese poetry called “The Poetry of Silence,” which Kennedy sees as showing “an improvement in style and some appreciation for economy in expression” (72). Cummings also wrote for the class a children’s story, “The King,”—“about a little boy who takes a toy elephant to bed with him at night” (Kennedy 72). It was published in The Harvard Monthly in July 1915. Maybe not entirely “unperturbed”: later, Cummings recorded in his notes that Lowell “turned to brick” (qtd. in Kennedy 84). After Amy Lowell, the young orator quoted from Gertrude Stein’s Tender Buttons, which functioned admirably, Cummings wrote later, as “comic relief” (cf. Kennedy 84-85). Whatever the audience reactions, the “New Art” speech showed, as Kennedy writes, a remarkably “discursive acquaintance with so much of the avant-garde activity in the arts” (83). This acquaintance was in part due to the tutelage of friends and mentors like S. Foster Damon and Scofield Thayer. As the previous “Cummings Centennials” article noted, it was Damon who introduced Cummings to much that was new in the arts, lending him copies of Poetry magazine and taking him to see the Boston version of the Armory Show in 1913. Much of the discussion in “The New Art” of art, dance, music, and literature is indebted to Damon’s influence. Cummings told Charles Norman: “Practically everything I know about painting and poetry came to me though Damon” (38). It was Damon who loaned to the young poet Gertrude Stein’s Tender Buttons (1914) and Ezra Pound’s anthology Des Imagistes (1914) (Dreams 78-79). 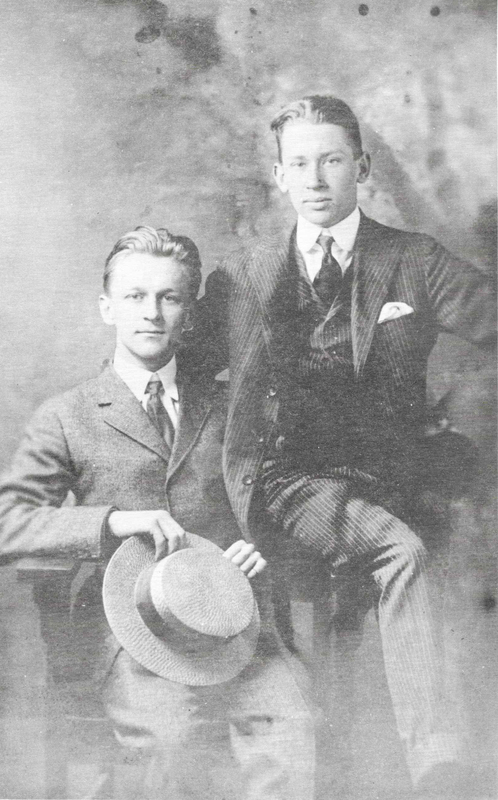 Damon also probably introduced Cummings to Alfred Kreymborg’s little magazine Others, which began publication in July 1915. Perhaps most importantly for Cummings’ future poetic career, Damon showed Cummings Ezra Pound’s Ripostes, which contained the poem “The Return.” Years later in the mid-1950s, Cummings wrote in his notes that this poem “made me(for better or worse)the writer I am today.” He was impressed by the poem’s modern treatment of a classical subject, but he noted that the “inaudible poem—the visual poem,the poem for not ears but Eye—moved me more” (qtd. in Kennedy 106). In 1957 Cummings wrote to Charles Norman that he would never “forget the thrill I experienced on first reading ‘The Return’ ” (Letters 241). Kennedy says they “drifted away from each other during 1916” (88). Despite his continued fascination with the new art, the poems that Cummings published in 1914-1915 in The Harvard Monthly show little evidence of this interest. 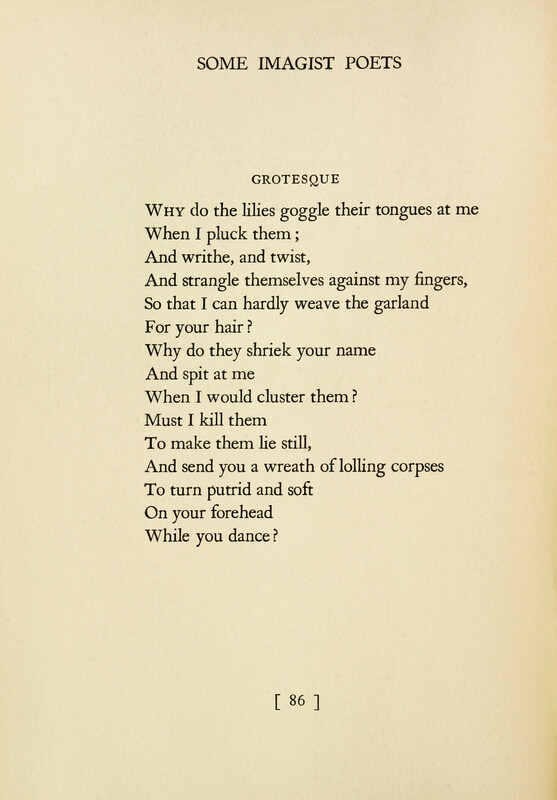 With the exception of a few memorable phrases, most of the poems Cummings published are overloaded with Pre-Raphaelite imagery (“her hands / Hurting the dark with lilies”) and rather precious metaphors (“In green cloisters throng / Shy nuns of evening, telling beads of song”) (CP 867 and CP 868). The themes of love, longing, and twilight that predominate in these poems would reappear in better form in Cummings’ more mature work. And while Cummings’ intense craftsmanship is evident in these poems, it is somewhat obscured by the elaborate and outdated diction. However, a refrain in “Nocturne,” published in March 1914, presages one of Cummings’ earliest triumphs. The lines “All silently I loved my love / In gardens of white ivory” (CP 864) were given a bit more medieval spine some two years later when he wrote: “All in green went my love riding / on a great horse of gold / into the silver dawn” (CP 15). The shift from vague symbolist longing to the creation of a scene in indelible images is a measure of Cummings’ growth in these years. Kennedy writes: “Six well-scratched-up pages in his working notebook attest to the care which he devoted to this piece. When it was published in the Monthly [in March 1916], it met with praise from professors and fellow-students alike” (Dreams 83). While some of the poems from this period not published in the Monthly exhibit similar Pre-Raphaelite or even Yeatsian diction (“The white rose of my soul / Is blown upon the ways” [CP 918]), others experiment with a rather tame free verse: “Moon-in-the-Trees / The old canoe awaits you. / He is not, as you know, afraid of the dark” (CP 921). This poem ends with Cummings reaching for a more personal extravagance: “In the nostrils of my nights / An incense of irrevocable mountains.” The sonnets written in appreciation for his friends and mentors Dory Miller, S. Foster Damon, J. Sibley Watson, and Scofield Thayer are often embarrassingly gushy. The one exception is Cummings’ attempt at humor in the poem dedicated to Watson (CP 927), but the wit is not well-controlled and falls flat. Absolute lights like baths of golden snow. The poem appears with the same punctuation and capitalization in Eight Harvard Poets (1917). When the sonnet was published in Tulips and Chimneys (1923), Cummings removed most capital letters, retaining only those in words that begin sentences, along with the two crucial capitals in the words “Death’s” and “They.” He also made two simple changes in punctuation in the first line—substituting a colon for the period after “garden” and a comma for the colon after “go”—adding more momentum to a line that nevertheless still lingers slightly. —. “The New Art.” The Harvard Advocate 99.10 (June 24, 1915): 154-156. Rpt. in E. E. Cummings: A Miscellany Revised. Ed. George J. Firmage. New York: October House, 1965. 5-11. —. Letter to Scofield Thayer. [July 1915?] Dial / Scofield Thayer Collection. Beinecke Library, Yale University. YCAL MS 34, Box 30, Folder 794. Huang-Tiller, Gillian. “A Note on George Firmage and E. E. Cummings’ Copy of Eight Harvard Poets.” Spring: The Journal of the E. E. Cummings Society 14-15 (2006): 274-275. Norman, Charles. E. E. Cummings: The Magic-Maker. 3rd ed. Boston: Little, Brown, 1972. Sawyer-Lauçanno, Christopher. E. E. Cummings: A Biography. Naperville, IL: Sourcebooks, 2004. Watson, Hildegarde Lasell. The Edge of the Woods: A Memoir. Lunenburg, VT: Stinehour Press, 1979. Webster, Michael. “Cummings Rewrites Eliot.” T. S. Eliot, France, and the Mind of Europe. Ed. Jayme Stayer. Newcastle upon Tyne: Cambridge Scholars Publishing, 2015. 75-91. —. “The New Art.” The Harvard Advocate 99.10 (June 24, 1915): 154-156. Rpt. E. E. Cummings: A Miscellany Revised. Ed. George J. Firmage. New York: October House, 1965. 5-11. Information on Cummings’ coursework at Harvard was gleaned from Kennedy 60-71 and Sawyer-Laucanno 59-62 and 76-79. LeBaron Russell Briggs (1855-1934), Dean of Men at Harvard and President of Radcliffe College from 1903 to 1923. See also Gillian Huang-Tiller’s “A Note on George Firmage and E. E. Cummings’ Copy of Eight Harvard Poets” in Spring 14-15, pp. 274-75. Sawyer-Lauçanno says that Damon showed Cummings the book in the fall of 1915 (72). Cummings’ copy of Ripostes, now at the Harry Ransom Center, is the 1913 American edition. Besides adding the first phrase, I have corrected Kennedy’s transcription by capitalizing “Eye.” The quote may be found in the Cummings papers at the Houghton Library, Harvard University, MS Am 1892.7 (90), “Notes for a nonexisting lecture (California),” folder 25, [labeled “Ezra”], sheet 258. Her full name was probably Doris Bryan. Perhaps the answer is found in these letters at the Houghton Library: MS 1892 (113) Bryan, Doris. 28 letters; 1915. No. 3, 9 & 10 with one photograph each; and MS 1892.1 (16) Bryan, Doris, recipient. 3 letters; [n.d.]. Stephen Scotti and ViVa Cummings!